IRAN|USA, an original exhibition organized by the Saint Mary’s College Museum of Art, presents a program of compelling video art and prints by artist and faculty member Peter Freund. 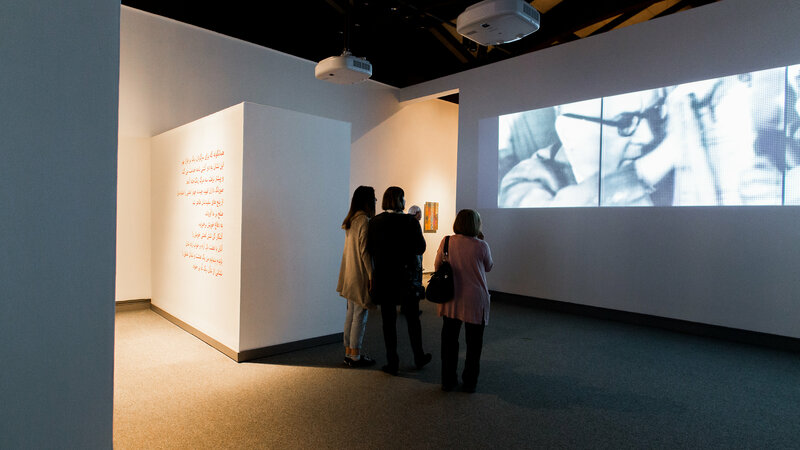 The multi-language exhibit re-envisions key moments in the politically charged history of the two countries through the lens of an experimental artist. The work poetically challenges our reliance on the visual archive as evidence in the retelling of the past. IRAN|USA brings together two audiences: one interested in contemporary art; the other interested in questions of social justice, history, politics, and media. A catalog with essays and other contributions by Jaimie Baron, Gelare Khoshgozaran, Hossein Khosrowjah, Targol Mesbah, Mike Noonan, Nasser Rahmaninejad, and the artist will be available for purchase at the Museum of Art. Freund is a Professor of Art Theory & Practice at Saint Mary's College of California, where he teaches experimental filmmaking and critical theory. Portions of the current show debuted at Tehran’s Sazmanab Center for Contemporary Art.